Give each player $50. The rest of the money is set aside for the bank. Shuffle the radio message cards and fare cards separately and deal one of each type to each player. Set the rest of the cards aside into two piles to the side of the board. Each player chooses their color and places the corresponding taxi in the corner space that matches the car’s color. Turn on the motor (pull up on the lever). Turn off the motor (push down on the lever). The goal of Hey Taxi! is to land your car on the spaces that correspond to the fare cards that a player has in their hands. When the motor stops all players will look at their own car. If a player’s car is touching a line between two spaces or is on two different spaces at the same time, that player will do nothing. 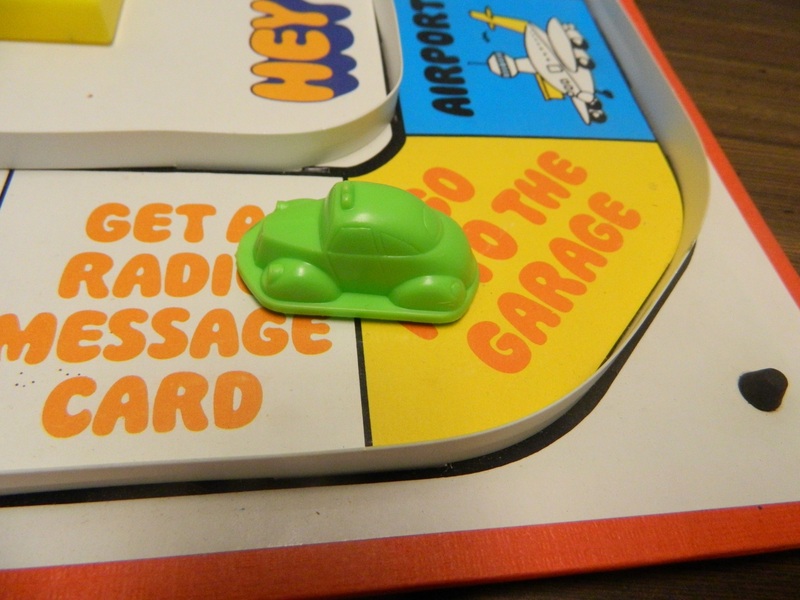 The green player’s car has landed between two spaces. The green player will not perform the action of either space. If the player’s car is on only one space, that player will perform the corresponding action. The green player’s car is fully on the space so they will do the corresponding action. The players will perform the following actions based on which space their card landed on. Pick Up A Fare Card-Draw the top fare card and add it to your hand. Airport, Hotel, Hospital, Theater-If the player has a fare card that matches the space that they landed on, they cash in the card and get the corresponding amount of money from the bank. This player landed on the theatre space and they had a theatre card. 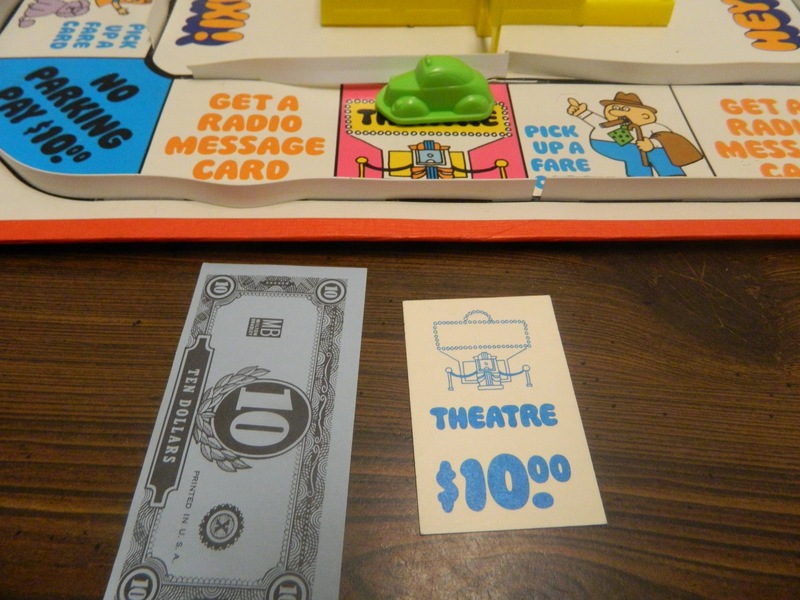 They cash in the theatre card and receive the corresponding amount of money from the bank. Go Into the Garage-Players who land on this space remove their car from the gameboard and place it on the garage/motor. The car remains in the garage for the next three turns. After three turns the car is returned to the board on the corner space that matches the color of the car. Speeding, No Parking-Pay the fine to the bank. 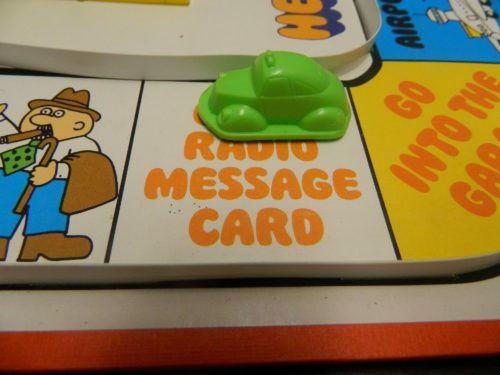 Get A Radio Message Car-Take the top radio message card and add it to your hand. If a player ever runs out of money and can’t pay a penalty, they do not have to pay the penalty. Send Another Taxi To The Garage-Choose another player’s taxi to bring to the garage for the next three turns. Pick Up A Fare Card-Take the top fare card from the draw pile. Collect Tip-Take the corresponding amount of money from the bank. Stop The Taxi At Any Time-This card is played during another player’s turn. This card allows the player to stop the motor at any time when it is not their turn. The game is played until the final fare card is drawn. This ends the game. Players count up how much money they have collected. The player with the most money wins the game. In the 1960s to 1980s a majority of the board games that were created were simple roll and move games. 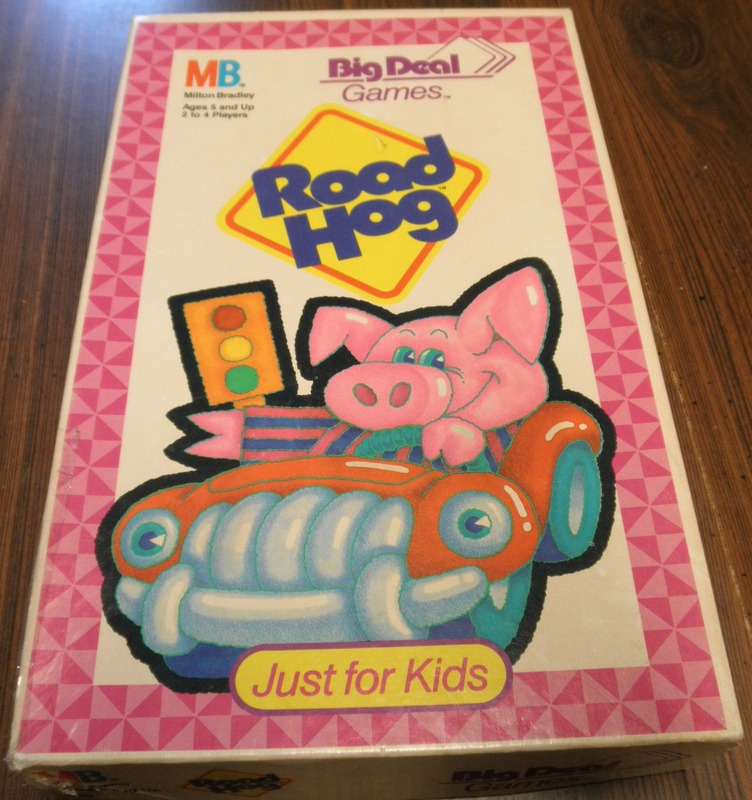 Parker Brothers and Milton Bradley mostly made generic roll and move games during this time period and many of them were quickly forgotten. That is generally what happens when so many of the same type of games are made every year. 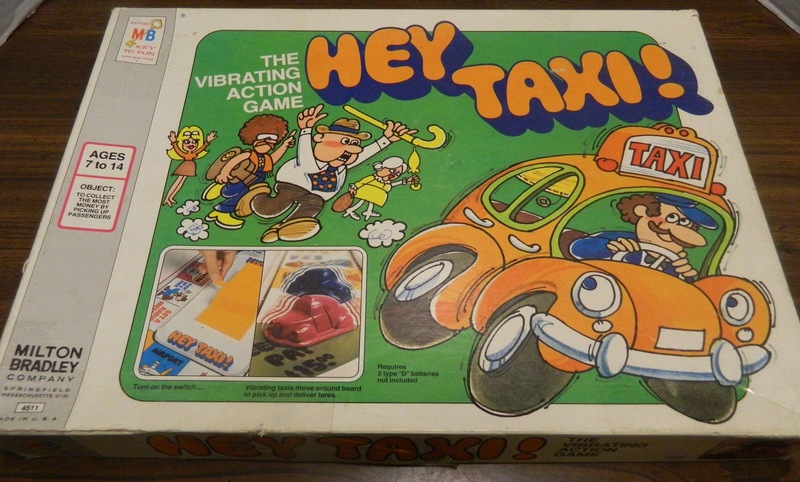 Today I am going to talk about one of these forgotten games of the 1970s, Hey Taxi! Hey Taxi! is kind of a strange board game. At its’ heart the game is a roll and move game and yet the game has no dice. The game uses a motor that vibrates the gameboard which makes the players’ pieces move around the gameboard. If you have ever seen Electric Football it is essentially that except that it uses cars and it plays like a roll and move game. I have to give the creators some credit for coming up with a unique idea for a board game. Who else would have ever thought of using the mechanics behind electric football to make a roll and move game? Hey Taxi! is a really simple game. Basically you have the option of playing a card and then you start and stop the motor when your car is on the right space. The cars move slow enough that you don’t need split second timing to stop the cars in time. If your car ever goes too far you can always wait for it to come back around to the same space since there is no time limit on when you need to shut off the engine. Despite playing hundreds of different board games, I don’t think I have every played a game like Hey Taxi! before. It is a weird experience playing a game that uses a motor to shake the gameboard which moves your playing piece around the gameboard. Instead of having to roll well, you need to be quick on the trigger to stop the motor at the right time. 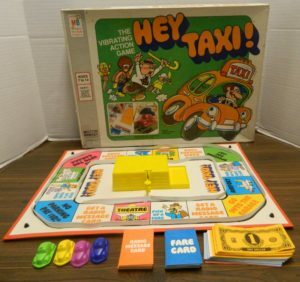 If you like playing strange board games, Hey Taxi! is definitely a unique experience. Just like it is interesting to watch the players in Electric Football scoot around the field, it is for some reason interesting to watch the cars move around the track. It is kind of fun watching the cars race each other around the track. Then there are the funny moments when the cars go haywire. At one point in the game one of the cars was doing doughnuts on the gameboard. While it is an original game that has some fun moments, Hey Taxi! just doesn’t work as intended. Some of this I think comes from age while I think other problems come from the game just being flawed. This is the type of game where it is pretty important to get a copy in good condition. The board is really important. If the board is warped or has other issues it can really mess with the game. While the gameboard for the copy I played didn’t look too bad, the gameboard was a little warped which probably contributed to some of the problems I had with the game. The main problem with the game is that the cars just don’t move around the track very well. The cars tend to crash into the corners and walls and basically get stuck. The cars might slowly move around the track but usually get into a pile up where none of the cars are able to move. A copy in very good condition might not encounter this problem as much but I think it is also a problem with the design of the game itself. Other than the cars not working that well, the game itself has some flaws. As I mentioned earlier the game is really easy. As a matter of fact if you are willing to wait long enough you can always land your car on the spot you want on any given turn. This is because you have no time limit unless another player plays one of the cards that lets them stop the motor. If you car gets stuck against a wall you can just wait it out until it gets to the space you want. Did your car go past the space you wanted? Just wait for it to come around again. Having no time limit on how long you can keep the motor running essentially takes all of the skill out of the game. This ability for players to take as much time as they want is one of the reasons I really like the card that allows players to stop the motor on other players’ turns. Unfortunately they don’t come into play nearly enough. This card adds a little strategy to the game since a player can spring it on you at any time stopping theirs and yours car at any time helping themselves and/or hurting you. I really think Hey Taxi! could have been improved quite a bit with a time limit. With a time limit players would have to make sub-optimal decisions instead of waiting until their car is on the space that they want most. I think the game should have given the current player a specified amount of time where they are the only player that can stop the engine. After the time runs out any player should be able to stop the engine even if they don’t have the associated card. I think this could have added some strategy to the game as the player would have to decide whether to try for their optimal space or settle for a sub-optimal space. This rule could actually be added to the game pretty easily since you could use a sand timer or some other type of timer to determine when everyone can stop the motor. Another rule that I found to be kind of stupid was the garage rule. Essentially the garage acts as “jail” for the game since you are stuck in it for three turns. I don’t have a problem with the idea of the garage but I think it is way too harsh. The garage should only keep players for one or two turns. Three turns is way too long even when it counts other players’ turns. Having your car stuck in the garage is boring as you just have to sit there waiting for the other players. Also if it is your turn and your car is in the garage there is no reason for you not to mess with the other players. Players also have way too much control over the other players’ fates. Since your moves impact you and all of the other players, it is not hard for a player to mess with another player(s). If a player wants to they can easily stop the motor when other players are stopped on one of the garage spaces or one of the spaces that make you pay a fine. If the current player is in the garage there is no reason for them not to do this. I think it is a good idea that the placement of all of the players at the end of a given turn matters since it keeps all of the players invested on every turn. This leads to problems where it is too easy to mess with your opponents though. 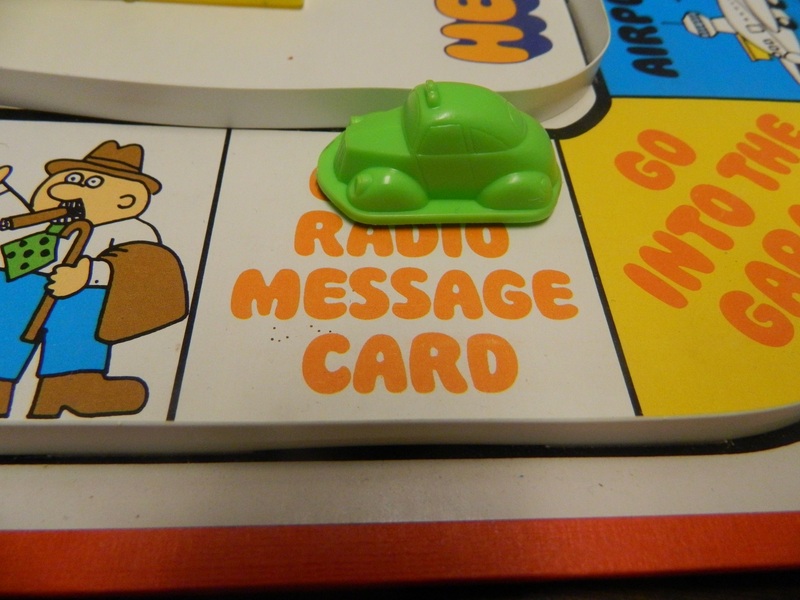 Like almost every other Milton Bradley game it should not come as a surprise that Hey Taxi! relies heavily on luck. Since some of the cards seem better than others, drawing the right cards will help you in the game. Luck is also key on other player’s turns. If a player is only focusing on getting their car to stop on a given space, luck will determine how you will fare on that turn. A lucky player will have another player stop their car on a helpful space during the other player’s turn. An unlucky player will keep landing on garage or fine spaces. Component wise there are things to like and hate about the game. I give the game credit since the motor for the copy that I purchased at a thrift still works 40 years later. The motor can get quite annoying though since it makes a pretty annoying sound. The cars are pretty good. The cards are pretty bland and what you would expect from a Milton Bradley game. The main problem with the components is that the game relies on the board working properly which is a shame since the board seems to warp over time. If you can get a copy in good condition the contents are not bad for a Milton Bradley game. Hey Taxi! is an interesting game. Credit is due for coming up with an interesting movement mechanic. Sometimes it is fun just watching the cars move along the gameboard. Unfortunately Hey Taxi! is flawed in a lot of ways. The cars just don’t seem to move around the gameboard right. Either the gameboard for my copy of the game wasn’t working right or the cars tend to get stuck in the corners and along the walls. The game has no time limit so players can just wait as long as it takes for their car to get to the space that they are looking for. This removes almost all of the skill from the game. Hey Taxi! is an interesting board game experience. If you like quirky Milton Bradley games you might get some enjoyment out of the game. I probably wouldn’t recommend the game though unless you can get a good deal on the game since it is flawed. If you don’t like quirky games or games that rely on quite a bit of luck, Hey Taxi! is not going to be the game for you. If you would like to purchase Hey Taxi!, you can purchase it on Amazon here . Has some interesting ideas for a roll and move game. Can have some funny moments. The game just doesn't work right. There isn't a lot of skill to the game.